Our U.S. Congressional Representative does not represent us on environmental issues. His career scorecard is 7 % as researched by the League of Conservation Voters. His 2015 score was 0%! That score was based on over 30 bills that were important to protecting us from dirty water, dirty energy and dirty air. 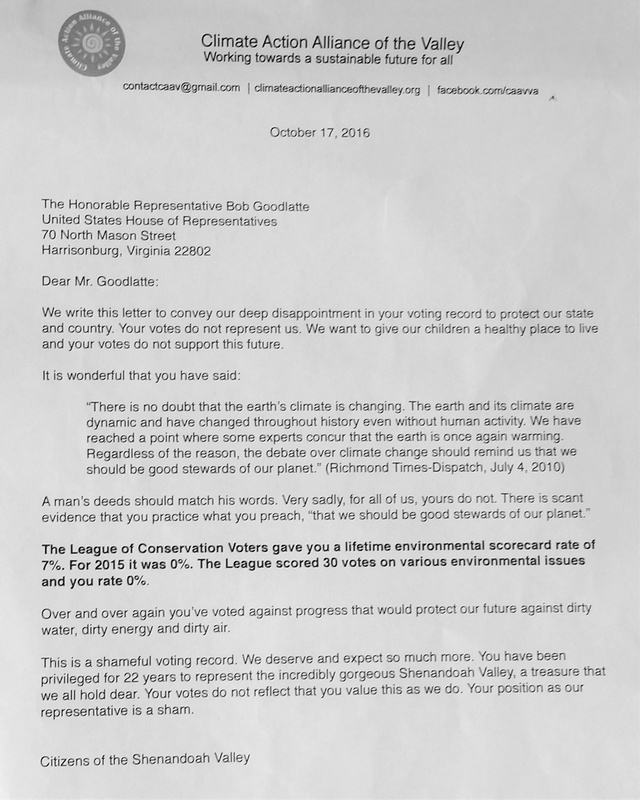 Over the last month, the Climate Action Alliance of the Valley has gotten over 130 signatures on a letter that states our deep disappointment in this record and how we deserve and expect representation that reflects the importance of our children’s health and the beauty of our Shenandoah Valley. Click here to read our letter to Goodlatte. We will read our letter aloud at 4:30 on the steps of Rep. Goodlatte’s office and hand deliver it afterwards. Come out and help us hold the big banner to show passing motorists on their way home that WE CARE AND WE ACT! Let YOUR voice be heard. Hope to see you there.